The easiest and recommended way to uninstall ASAP Utilities is to do this via the Windows Control Panel. Enter uninstall, and then tap or click Settings. If other users on the same computer used ASAP Utilities too, you will have to manually remove ASAP Utilities from their list of Excel add-ins. This is something that can only be automated for the user that runs the uninstall due to the design/restrictions of MS Windows. In such a case the user has to follow step 4 till 7 of the manual uninstall. As an alternative you can also use the following method to uninstall ASAP Utilities. In the Excel menu go to "Tools", "Add-ins" and then uncheck the check box next to ASAP Utilities. This will remove ASAP Utilities from the menu. If you have chosen the automatic install you can go to the software option in your control panel to uninstall ASAP Utilities. 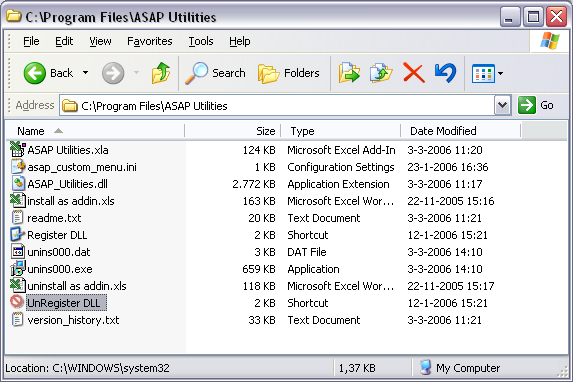 You can also run "unins000.exe" from the ASAP Utilities installation folder. The uninstaller removes all ASAP Utilities installation files and removes all ASAP Utilities entries from the registry. If you have specified an alternative location to store your favorites menu settings you have to manually remove the file asap_custom_menu.ini from that location. 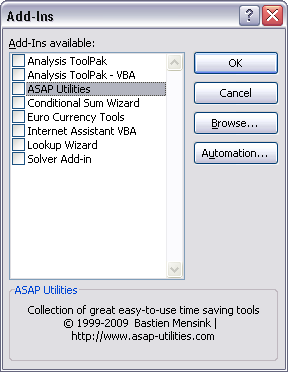 If you have used the automatic setup of ASAP Utilities we recommend the automatic uninstall. Close Excel, if it is opened. 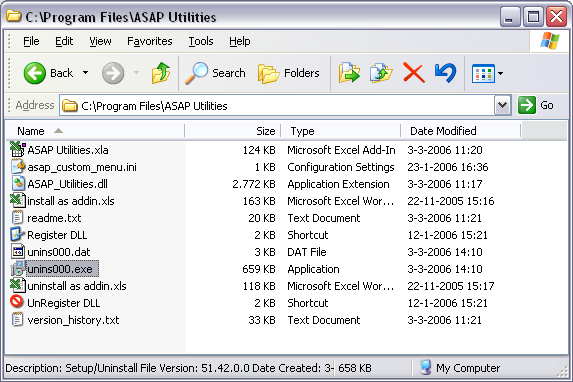 Delete the folder where the ASAP Utilities program was installed. Usually this is [C:\Program Files\ASAP Utilities]. Start Excel, you will now receive an error, indicating that ASAP Utilities could not be found. Now close the dialog. ASAP Utilities is successfully uninstalled. 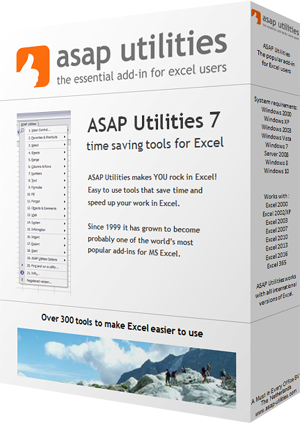 ASAP Utilities is removed from your computer and Excel. 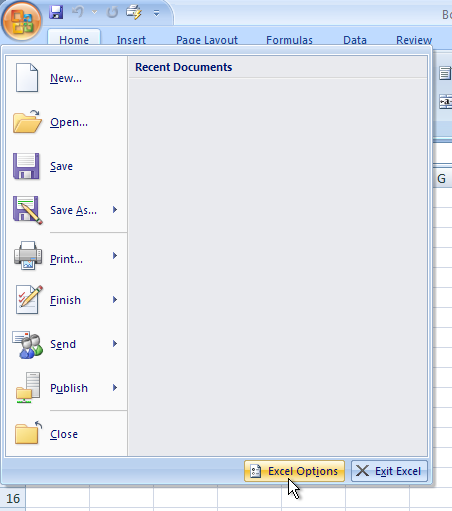 Start Microsoft Excel and click on File (or the upper-left Office icon in Excel 2007). 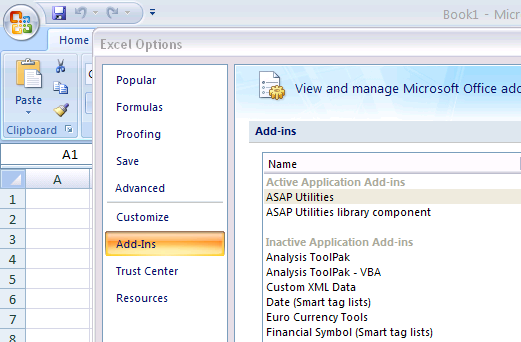 In the Excel menu go to Tools > Add-ins and then uncheck the check box next to ASAP Utilities. This will remove ASAP Utilities from the menu and it will not be automatically started with Excel. 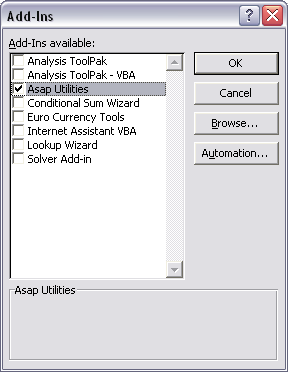 If you want to enable ASAP Utilities again, check the checkbox next to ASAP Utilities again.